Students could be paired for exploring this visualization and the resources that accompany it. Teachers should prep students about units, scenarios, and the difference between observed data and modeled data. The models listed under 'More Options' should be explained for learners. 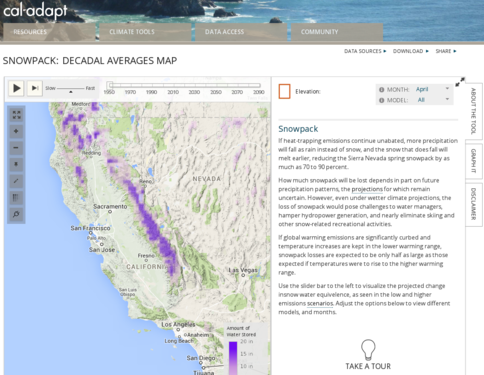 Other interactive California-based maps to use in conjunction with this one are available at http://cal-adapt.org. Students use an animation to visualize the projected change in snow-water equivalence in the state of California. Students can view predicted changes in snow pack by using different models. Clearly illustrates model predictions of snowpack under different climate change scenarios. Has links to data sources, and explains uncertainty in climate modeling. Although any projection must be a model, the difference between observation and projection could be better emphasized. Very relevant for students in CA since they can choose their local region and see predicted changes in snow pack. Can also be used as a case study. Has a graphing tool to display data. Users will need to access instructions and supporting resources that accompany the visualization to fully understand what the interactive shows and what it implies for California's water supply. Visualization is more effective when animation is run on "slow" setting.